Boston Ballet last presented “Onegin” in 2002. It’s been too long. 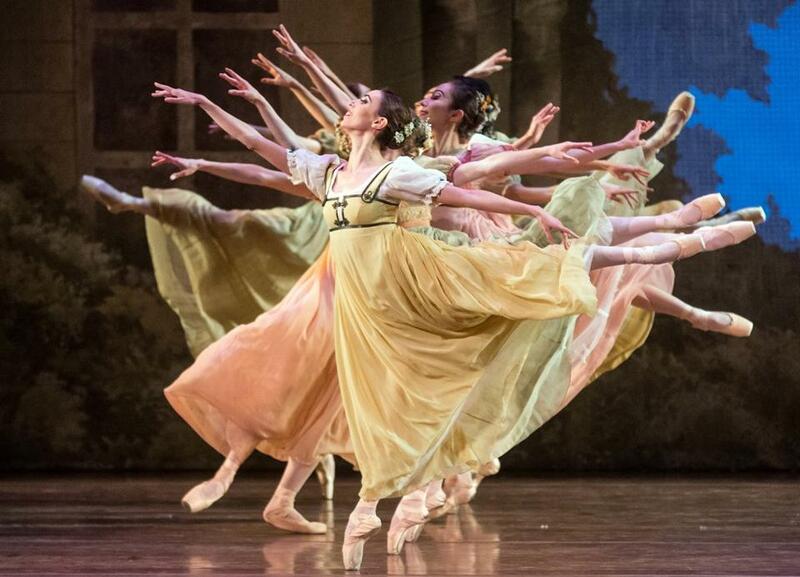 As 20th-century story ballets go, John Cranko’s 1965 work ranks with the Prokofiev-scored “Romeo and Juliet” and “Cinderella.” And Thursday’s opening night, led by fabulous performances from Petra Conti and Lasha Khozashvili, was worth the 14-year wait. Based on Alexander Pushkin’s sublime verse novel “Eugene Onegin,” Cranko’s ballet has its own wonderful score arranged by Kurt-Heinz Stolze from lesser-known Tchaikovsky compositions. Boston Ballet’s three previous presentations took place at the Wang Theatre; the company needed a new production that could fit into the Opera House, and it finally found one it could lease from the Dutch National Ballet. Pushkin’s tale is elegantly simple. Our hero, a bored St. Petersburg socialite, visits his poet friend Lensky in the country and is introduced to Lensky’s fiancée, Olga Larina. Olga’s bookworm sister, Tatiana, falls for the city aristocrat; Onegin, still bored, rejects her. When Lensky drags him to Tatiana’s name-day party, Onegin gets back at him by dancing repeatedly with a compliant Olga. Enraged, Lensky challenges Onegin to a duel and is killed. Years later, Onegin returns to St. Petersburg and discovers his gawky country girl is married to a stout older man, a prince and general. Now he falls for her, and Tatiana still loves him, but she won’t leave her husband. Over the course of three acts (the production runs 2½ hours, with two intermissions), Cranko softens Pushkin’s sharp satire, omitting to mention, for example, that after Lensky’s death, Olga finds a new fiancé in short order. 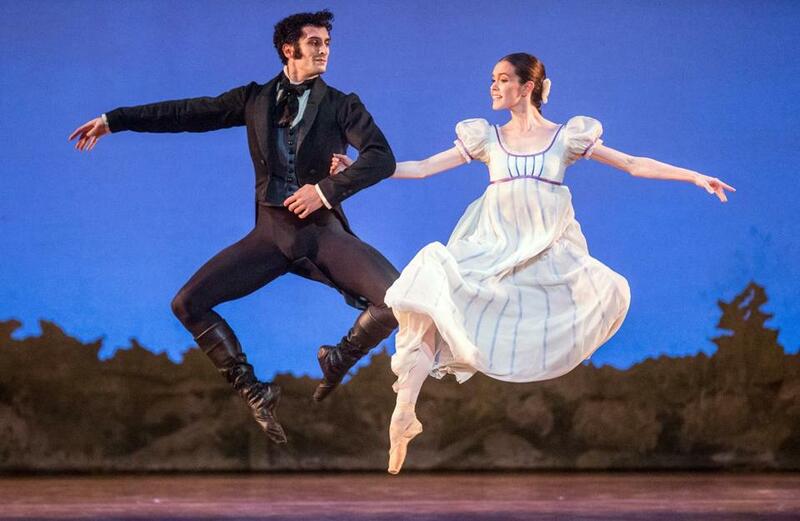 His major innovation is the first-act pas de deux for Tatiana and Onegin. She’s in her bedroom writing him the most famous letter in all of literature when she falls asleep; in her dream he steps through her pier glass and dances with her. Their passionate third-act pas de deux, which ends the ballet, is a mirror image of the first one. Elisabeth Dalton’s set begins with a scrim boasting a handsome portrait of Pushkin and the first four lines, in Russian, of Tatiana’s letter. Her house for the Larin family is a mighty two-story stone edifice sheathed in a gray-green forest of trees, and she puts the first-act ladies in empire dresses. Tatiana’s bedroom is a vast chamber that dwarfs her canopied four-poster. The Larin ballroom is also vast, in beige, with a few French Provincial chairs and a pair of rose-colored tuffets; the ballroom of Prince Gremin, Tatiana’s husband, is spare, with massive columns and hangings. Overall it’s an unobtrusive, pleasing design that affords ample space for dancing but is short on detail. That was provided by Thursday’s cast. Khozashvili begins as a good-natured Onegin with, in his brooding first-act solo, hints of vulnerability. He turns severe after receiving Tatiana’s effusive letter, then is devastated, in Act Three, to see what he turned down. Conti begins as a dreamy, repressed little girl of a Tatiana who hunches her shoulders and ogles Onegin as if he were a rock star. Khozashvili executes some nice double tours and Conti flits like a butterfly in her party solo, but these roles demand good partnering more than individual technique, and that’s where this pair really excel. For all that he throws her about with speed and abandon, her every airborne position is a delight. 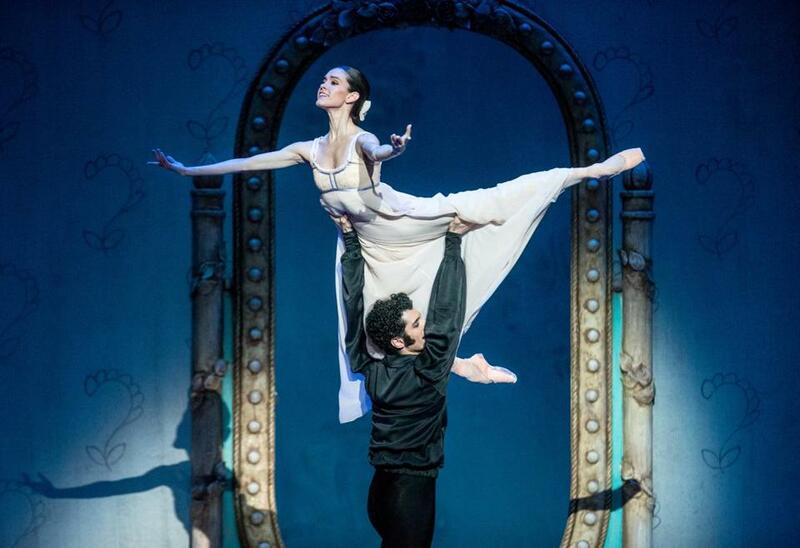 Even the candlestick lift in the bedroom pas de deux looks easy. Ashley Ellis’s Olga is exuberant and flirty; Patrick Yocum’s Lensky is callow and earnest. 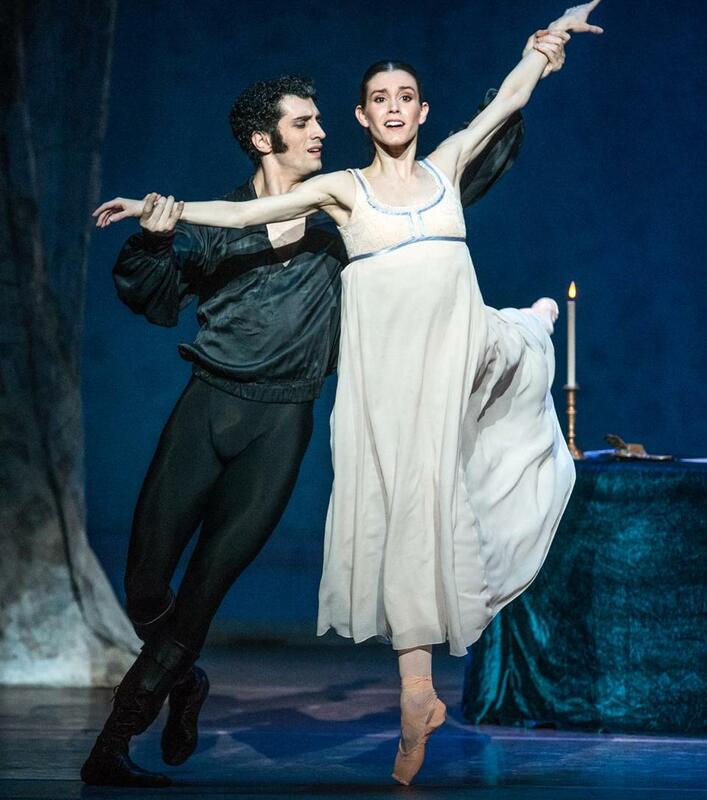 Both characters are a little shallow — which is how Pushkin describes them — and, like Khozashvili and Conti, the two dancers are well-matched. Ellis teases effortlessly; Yocum has good extension and an easy ballon, and he brings poetry, if not total security, to his pre-duel soliloquy. Bo Busby’s Gremin is an attractive, attentive father figure. Sarah Wroth is hilarious playing a Larin relative at the party, and one of Tatiana’s older relations is even made up to look like Pushkin. Thursday’s guest conductor, David Briskin, is the music director at the National Ballet of Canada. His performance was oddly literal and flat-footed to start but quickly improved. And though the instrumental spotlighting was occasionally distracting, he gave the dancers room to stretch out when they needed it.